(NaturalNews) The Bill and Melinda Gates Foundation is financially backing and publicly endorsing mass polio virus vaccinations in India. In case you didn’t hear him yourself, Bill Gates publicly announced that vaccines could help reduce the world population by 15%. 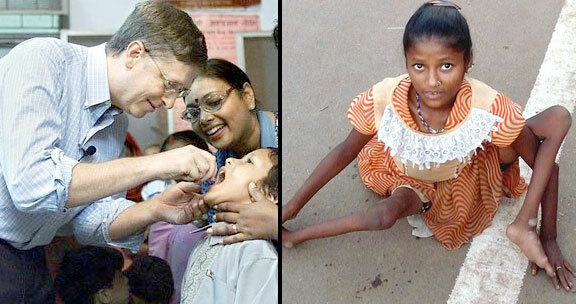 The Bill and Melinda Gates Foundation program in India was promoted as “The Last Mile: Eradicating polio in India.” The promotional video displayed numbers showing thousands of cases of polio in India decades ago, with the number of cases dropping to 42 by 2010. But it appears that wild polio virus stats have been traded for polio from vaccines and non-polio acute flaccid paralysis (NPAFP). In India, over 47,000 cases of NPAFP were reported in 2011. The paralysis symptoms of NPAFP are practically the same as what’s attributed to “eradicated” wild virus polio. Apparently, vaccine polio viruses also cause polio paralysis. Some experts argue that wild virus polio rarely causes paralysis and was declining on its own before the Salk vaccine (http://www.vaclib.org/basic/polio.htm). Ironically, the Salk vaccine contained SV-40 (Simeon virus 40) associated with cancer’s surge since the 1950s. In neighboring Pakistan during 2011, 136 children came down with polio. Yet 107 of them had been vaccinated multiple times with oral polio vaccines (OPVs). That’s over 78% of those supposedly “immunized” against polio getting that same disease (http://www.immunizationinfo.org/vaccines/polio). Yet the Gates Foundation wants to vaccinate the world? Hmmm. OPVs have been phased out in western countries because of their high incidence of adverse side effects. This type of vaccine was developed by Dr. Albert Sabin and FDA approved in 1963. The viruses in this vaccine are not dead. They are merely “attenuated” but still alive. What is done with OPVs that are produced but banned in the West? Dump them on third world countries with the humanitarian cover that they are less expensive and easier to administer to large groups simultaneously. Outbreaks of paralysis using labels other than polio, such as NPAFP (non-polio acute flaccid paralysis), conveniently obscures polio outbreaks among vaccinated populations. Experts outside the vaccination dogma box point out there are other polio type maladies with different names, including NPAFP, Guillain-Barre Syndrome, and others. Some incidents of vaccine-derived poliovirus (VDPV) from OPVs are reported, which is why OPVs were banned in the West. Those polio episodes can be vaccine-associated polio paralysis (VAPP). VAPP affects only those who had consumed the OPVs. Yet there are other ways OPVs can spread polio. Family members, friends, even villagers associated with those who took OPVs can be infected from viral shedding. Viral shedding is common among OPV vaccinated persons and those inoculated with attenuated live viruses. The attenuated viruses become more virulent after residing in the vaccinated person’s body. Upon excretion, water and materials exposed to the urine or stool has been known to spread this now more virulent polio virus to others. Read more on case histories of OPVs’ causing polio in the USA and Nigeria, both to vaccine recipients and to others from rejuvenated viruses shed by those who were vaccinated: http://www.naturalnews.com/026951_vaccine_virus_vaccination.html. This “Last Mile” campaign has caused many to walk their last mile. A lot of money has been spent for this campaign, money that could have been used more wisely on improving general basic living health conditions to minimize all diseases. When millions are spent on vaccinations instead of improving basic sanitation and potable water in poorly developed regions, there is another agenda behind the humanitarian cover story. The WHO, which is working with Mr. Gates through GAVI, classifies the paralysis occurring in India as non-polio acute flaccid paralysis (NPAFP). Perhaps Bill Gates might consider that while Monsanto’s Bollywood PR worked to sell Bt seeds and Gates’ Bollywood PR worked to push his polio vaccines, no Monsanto PR changes the reality of the farmers’ suicides. And ‘relabeling’ paralysis after the vaccines were given does not change the facts. Paralysis is paralysis to the child who can no longer walk. Death is death to the parents who have lost a child.